Dr C. Nicole Mason was born in Los Angeles, raised by a beautiful but volatile 16-year-old single mother. Early on, she learned to navigate between an unpredictable home life and school where she excelled. Having figured out the college application process by eavesdropping on the few white kids in her predominantly Black and Latino school, and along with the help of a high school counselor, Mason eventually boarded a plane for Howard University, alone and with $200 in her pocket. Mason found a path out of poverty – something that only 4% of America’s impoverished population are able to do. An alarming majority will never rise into the middle class, and so it seems that in the US, if you’re born poor, you stay poor. And no one is being very honest about this invisible caste system. Mason is a vocal advocate against the presumption that the poor are poor simply because they don’t help themselves enough. “[In college] we heard a lot of things about welfare queens, people living off the system, not wanting to work, women being lazy, having multiple children. And that really wasn’t the reality for the women who were actually impoverished.” Mason found that the policies were detached from reality, and in fact the barriers built into the system (some intended to motivate people) – such as time limits, additional child penalties, and few provisions for childcare – were ineffective and suppressed social mobility. “What was excluded from that policy was a clear pathway out of poverty, like education,” she says. When people think of poverty they think in terms of money and material resources, but a large part of being poor is suffering from a lack of social connections and networks, and living in a low-income area with no infrastructure that enables the leap up to the middle class. If institutions and leaders want to support and elevate poor communities, Mason argues that they need to provide better infrastructure (like libraries, parks, good grocery stores, and hospitals) as well as bridging programs both within the community and, very importantly, outside of it, so people can get in contact with people outside of their normal social network. “We just need to be honest about what it really takes for everybody to have a fair shot at the American Dream,” she says. 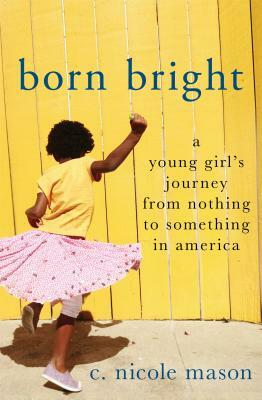 Dr. C. Nicole Mason’s new book is Born Bright: A Young Girl’s Journey from Nothing to Something in America.